Home / Angela Huffman's Reflections / We’ve Got Some Exciting Classes Coming Your Way! We’ve Got Some Exciting Classes Coming Your Way! The workshop I’m most looking forward to is Claudia Pfeil’s (P)Fantastic Adventure. 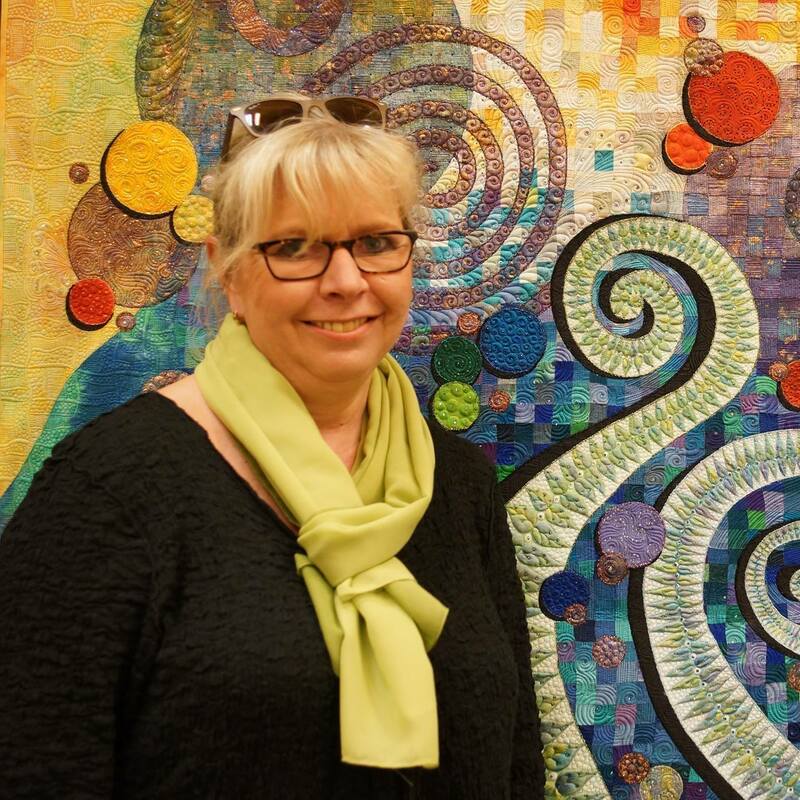 You may not recognize Claudia’s name, but if you’ve been to any major quilt show in the last few years you’ve probably seen one of her amazing quilts! Claudia is an incredible quilter who has won awards at shows across the globe, including a Best of Show ribbon at Road2California just a few weeks ago. The Road2California blog has a great article about Claudia’s talent and journey and you can read it here. Claudia is a free motion quilting kind of girl and she doesn’t use rulers. The six classes she’ll be teaching over two days here at the Quilted Joy studio will reflect her free motion style with lots of modern filler designs, her signature (p)feathering style, and more. We’ll even spend some time designing our own wholecloth quilt using all the skills we’ve learned in class. These two days are going to be so much fun, and I’m looking forward to learning with you all too. Claudia’s classes will take place May 11-12 and will be lecture and demonstration. It’s time for you to get out your sewing machine and step into the fantastic world of machine quilting! My newest free motion quilting class is a primer in free motion quilting on a sit down, domestic sewing machine. In his hands on class we’ll be quilting a wholecloth baby quilt. I’ll show you how to use both straight line quilting and free motion quilting to learn the basics of machine quilting. You will create your very own wholecloth baby quilt in class with a simple fold over binding – no piecing required! I will share tips on how to prep your quilt tops for quilting, selecting threads, fun beginner stitching designs, tension and more. Are you ready to begin your free motion quilting journey? The Machine Quilting Primer: Wholecloth Baby Quilt class is on March 10 and I hope you’ll join me! Click here to see images of the class sample, read through the class supply list, and sign up for the class. Or Maybe You’d Like to Learn Free Motion on a Stand Up Longarm? My next session of the Skill Builders: Breaking into Freemotion on the Longarm is almost here! I designed this class with my longarm renters in mind. These folks are comfortable using the stand up longarm machines with paper pantographs or design boards. Moving to the front of the machine shouldn’t be scary! In this hands on class we’ll spend a few hours playing with easy freemotion designs that will work great on your next quilt. I’ll be teaching this on Saturday February 17. You can sign up for the class here! Last year I hosted a couple of fun Laura Heine Fabric Collage classes. Ever since I’ve had lots of people asking when I’ll be having the class again. I’m inviting you to spend a relaxing afternoon creating your very own Laura Heine Fabric Collage Quilt! There are only a few spots remaining. If you’d like to participate you’ll definitely want to reserve your space soon! Click here to learn more about these amazing quilts and to sign up for the class! In the Learn Patchwork Classes we’ll focus on one basic patchwork shape. These fun classes are perfect for the beginner or someone who wants a refresh on their piecing skills. In March we’ll focus on the half Square triangle and in April we’ll learn the Flying Geese block. We’ll learn multiple ways to create these shapes and cover tips that will allow you to knock out a stack of them very quickly. Then we will look at surprising ways to combine them in a variety of layouts for beautiful quilts. Plus, we will examine a few ways to quilt this basic patchwork shape for both sit down and stand up quilters. Be sure to check the supply lists for each of these classes! Click here to sign up for Learn Patchwork: Half Square Triangles. Click here to sign up for Learn Patchwork: Flying Geese. Make Space in Your Closet by Turning Those Old Shirts into Quilts! T-shirt quilts are a special way to showcase memories from all those activities & special events. Elevate all those shirts from high school, college, or other fun activities. This class will teach you how to turn t-shirts into uniform blocks, and then set them together with sashing fabric so it is ready to be quilted. You’ll start with 4 of your t-shirts and be guided through creation of a simple 2 shirt x 2 shirt quilt top ready for quilting! Once you’ve learned how these four go together you’ll be able to create a t-shirt quilt top of any size you choose! I’ll be teaching this class on Saturday March 31. You can click here to reserve your spot in the class today! Next post: One Log Cabin Block, Four Totally Different Quilts!